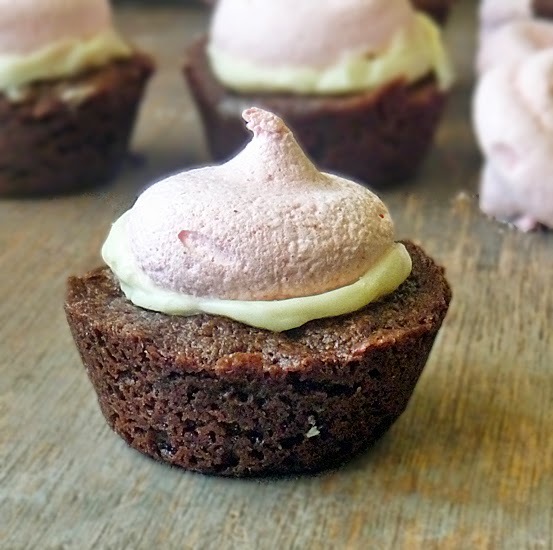 Strawberry Brownie Kisses are little bite sized pieces of chocolate bliss. I used my Easy One Bowl Brownie Recipe and topped it with a simple strawberry meringue dipped in white chocolate. 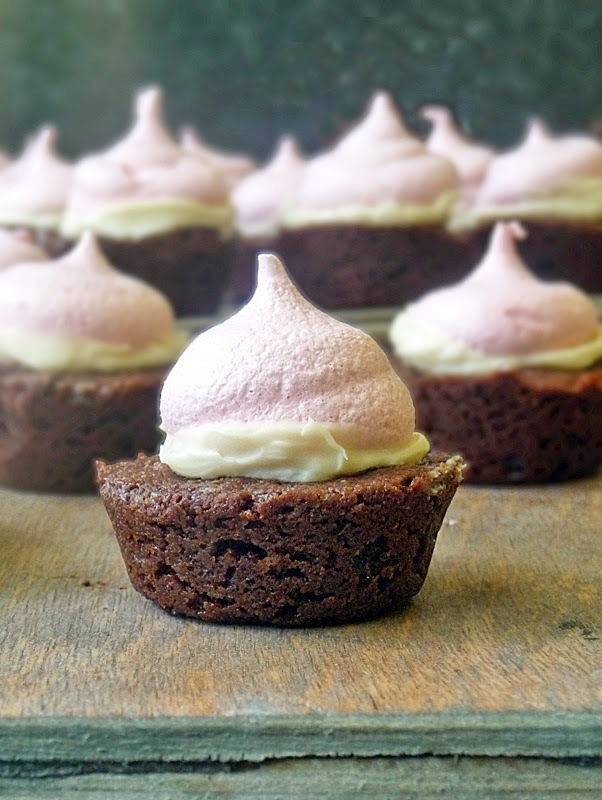 The strawberry meringue is a light and airy cloud atop the chocolaty goodness of the brownies. A perfect pairing! I made this beautiful brownie creation as my entry into the Dixie Crystal's Brownie Dessert Contest being held in conjunction with the 2014 Food and Wine Conference. You can enter too! The winning brownie recipe will be a featured dessert at the Conference, as well as being featured on Dixie Crystal's and Imperial Sugar's websites! EEEK! So exciting! As if that wasn't enough, the winner also gets a $500 gift card and one ticket to the 2014 Food and Wine Conference! Click on the link to enter!! There are several other contests too, so be sure to check out the contest page! I was chosen as an Ambassador for the 2014 Food and Wine Conference being held in Orlando, FL, July 18th-20th at the Rosen Shingle Creek, and I couldn't be more honored! 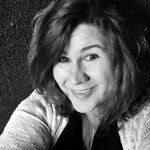 I am so excited to meet new foodie friends and learn from the best! I sure hope to see you there!! Is it July yet?? Make my Easy One Bowl Brownie Recipe, but spoon the brownie mixture into greased mini muffin cups to fill each cup about 3/4 of the way full and bake for 15-18 minutes or until done. Cool in pan for 5 minutes and remove to wire rack. Cool completely. While brownies are cooling, prepare the strawberry meringue. Preheat the oven to 300 degrees F. and line a baking sheet with parchment paper. Place 3 eggs whites (at room temperature) into a mixing bowl with 1 teaspoon white vinegar and 1/8 teaspoon salt. Using an electric mixer with the whisk attachment, beat on high until soft peaks form. When you lift the whisk out of the mixture the peaks will stand up but the tips will curl down. Gradually add in 2 tablespoons of Dixie Crystals sugar and 1 tablespoon strawberry flavored gelatin powder. Give it a taste to make sure it is sweet enough for you and has enough strawberry flavor. You don't want it to be too sweet or too strawberry as it could overpower the brownie. We want just enough strawberry sweetness to compliment the brownie. Add a little more if needed and then beat on high until stiff peaks form (tips will stay upright). Spoon this mixture into a pastry bag fitted with a medium-large round tip and pipe the mixture into kiss shapes onto the parchment lined baking sheet. Bake the meringue kisses for 15 minutes and then turn off the oven and leave the baking sheet in there for another 15 minutes. Remove from oven allow to cool. Melt the white chocolate according to the package directions. I used a microwave safe bowl and mircowaved on high for about a minute, and then I stirred and stirred and stirred until it was a creamy consistency. This used the heat from the bowl to melt the rest of the chocolate. You have to be very careful using the microwave to melt chocolate as it can scorch and seize up on you and that would be sad. There's no fixing it if that happens! Being careful not to break your meringue kisses, carefully spread some white chocolate onto the bottom of a kiss and place atop a brownie bite. 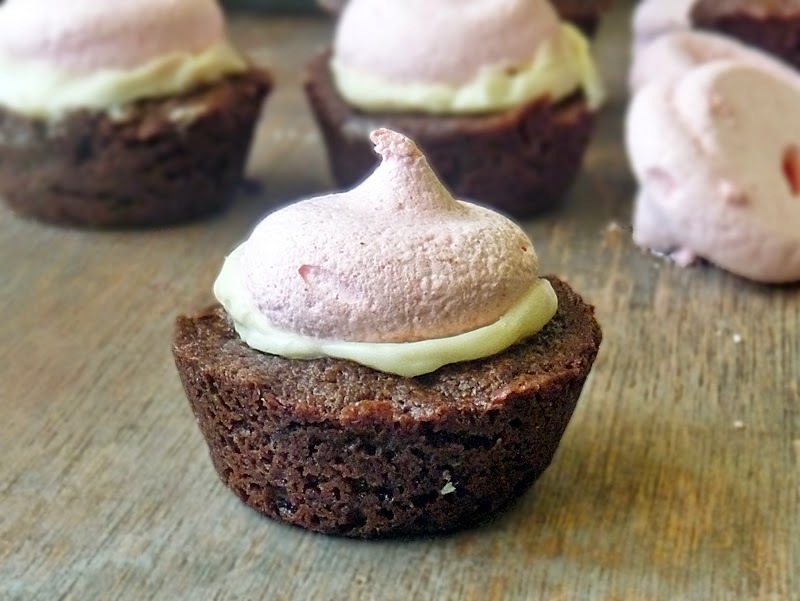 Continue until all brownies are topped with these delicious and adorable kisses. Enjoy! Follow Life Tastes Good's board Life Tastes Good: Sweets on Pinterest. Yes, please. I will take a dozen! These look so good. Thx for sharing your recipe on MM. Hope you come back next week. Very creative! They look wonderful! These look so great! Good luck!